On New Year’s Day this year, I really was hankering for a schmitter. Like seriously. I hadn’t craved something so specific in a long time, and this is what I needed to have. I was stupid and didn’t check if they were open. So while in a ravenous hunger and after having trekked through snow, I learned it the hard way. Cue the sad face. And since we were all the way up there, and because the other chestnut hill pickins were also quite slim, we ended up at Cosimo’s Pizza Cafe. 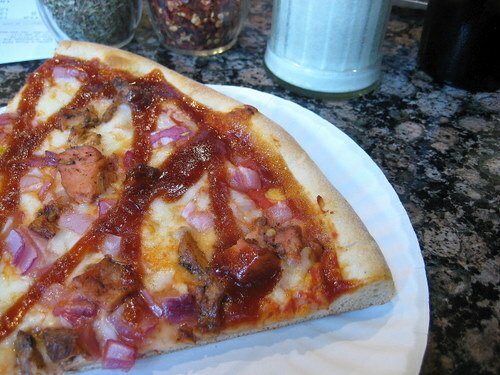 I got this gigantor sized slice of barbecue chicken pizza, which was pretty darn good. 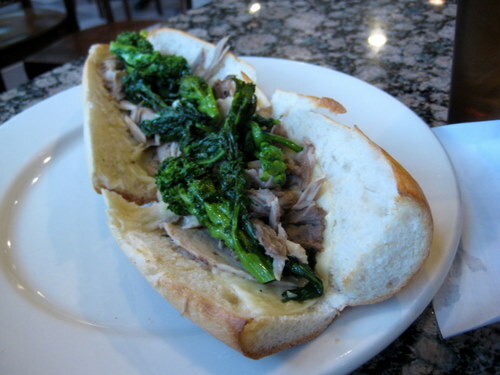 J got this italian pork sandwich with broccoli rabe. Sadly, it was more like a broccoli rabe sandwich with pork. Really though, look how paltry the pork portions are here! And the pork was a bit on the dry side too. Well, at least the pizza was good! Mmmm! Pizza is one of my favorite things ever.